I’m a little behind on blogging this one but John’s at it again. 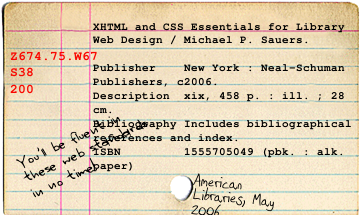 Go retro by creating your own library catalog cards online, scribbles included. How to write a card catalog? How to write an analytical entry & how a research of a scholar is compiled in the catalogue card?